Proteins are found in every cell, tissue and organ in your body. Protein sources are also essential to your diet. In most cases, you do not need to buy protein shakes or take supplements to meet your body's need for this nutrient. If you are healthy and eat a varied diet, you probably are already taking in sufficient protein. Even vegetarians and vegans can meet their daily protein requirements by eating a variety of plant-based protein sources such as corn. The recommended dietary allowance of protein for adult men and women is 56 and 46 grams, respectively. A medium-sized ear of corn contains about 2.9 grams of protein, or 5.17 percent of the RDA for men and 6.3 percent of the RDA for women. One cup of boiled yellow corn yields 5.08 grams of protein, or approximately 9 and 11 percent of the RDA, respectively, for men and women. Proteins are comprised of 20 different amino acids. Some of these are not made by your body and as such are considered essential amino acids because you must obtain them from your diet. Animal-based protein sources contain all the essential amino acids. Most plant-based proteins, like corn, can offer significant protein, but do not contain all the necessary amino acids. 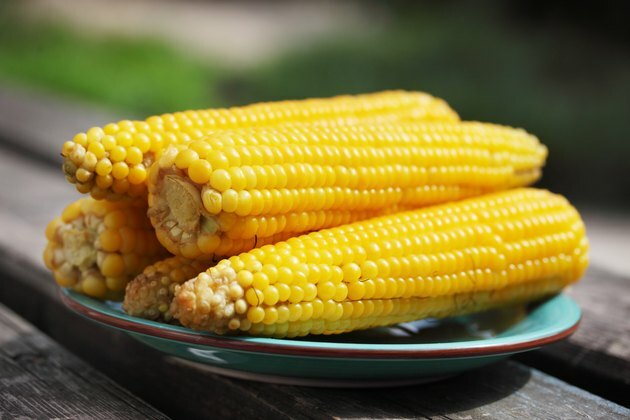 To benefit from corn's protein, you should eat a variety of plant proteins throughout the day.